The 2016 Kia Cadenza is more sedan than you'd expect at less than you'd expect to pay. Roomy, comfortable, attractive, with a competent and smooth powertrain, luxurious interior and impressively lengthy complement of features, the Cadenza defines the notion of a lot of automotive bang for your hard-earned bucks. Attractive, loaded with features, luxurious, engaging to drive and all at an appealing price. If that sounds good to you, get yourself down to the local Kia dealership and give the 2016 Cadenza a good, hard look. It certainly gets our recommendation. If you really have your heart set on something that's higher on the ladder of sporty driving experiences, you will likely be happier with some other choices. Still, the Cadenza is no slouch, so you better be honest with yourself about your own sporting pretensions, automotive-wise. New for the 2016 Kia Cadenza is an entry-level base trim that slots in below the Limited and Premium; navigation is now standard on all models; the panoramic roof is standard on the Premium (middle) trim level; and the Limited Package adds Blind Spot Detection and Rear-Cross Traffic Alert. Rather than "striking," the Cadenza's interior is clean, thoughtfully arranged and carefully detailed. Front and center is an 8-inch touch screen for the navigation system and rearview camera, below that the climate and audio controls. Every item for system control, information delivery or vehicle operation is exactly where expected. While some might consider this configurational normalcy boring, the Cadenza's familiar ease of use brings motoring peace of mind. The Cadenza also brings comfort and plenty of room. Front seats are unobtrusively accommodating and the rear seat fulfills every reasonable expectation for a full-size sedan with luxury connotations. While not a parking-lot eye-grabber, the 2016 Cadenza shows visual proportion, balance and artful detailing. Kia has done a good job of building brand identity with what has become its signature grille shape, with the distinctive pinched middle; the door handles are nicely integrated into a crease that runs along the side; and the taillights neatly blend into other design elements. While not far out on the edge of design, there is not a surface, detail, fold or curve that is out of place. We think it's a handsome piece of work. Typically, buyers in the market for larger, front-drive luxury sedans are interested more in smooth and spacious comfort than athleticism in attacking curving onramps, yet still want a decent level of responsive and capable handling when the pavement does change direction. For such folks, the 2016 Cadenza should be their precisely brewed cup of tea. Pampered comfort comes first, but the Cadenza deals with life's alternate paths with security and precision and delivers confidence-inducing steering feel. Also getting high marks are the smooth, almost velvety powertrain, the more-than-ample performance and the remarkably quiet interior, all of which contribute to a sweet and unobtrusive cruise from home to work or from time zone to time zone. Anyone who complains about the Cadenza's driving feedback needs to either readjust their own scale or look for something different, because this thing is just fine, thank you. The well-equipped base 2016 Kia Cadenza has a Manufacturer's Suggested Retail Price (MSRP) of around $34,000; the Premium trim level is about $37,000 and the upscale Limited is around $45,000. For many buyers, we would suggest considering the Premium trim level and then carefully selecting the additional, optional features most important to you, thus having the car you want without having to go all the way to the Limited price level. You can easily end up within Toyota Avalon or Chevrolet Impala pricing, and even into the Lexus and Acura range. Before heading to the dealership, be sure to check the Kelley Blue Book Fair Purchase Price to see what others have paid for a 2016 Credenza. While resale values of Kia vehicles have been climbing, we expect the Credenza's residuals to still lag behind those of Toyota, Lexus, Honda and Acura. The 2016 Cadenza includes an impressive array of standard equipment. The base model has 18-inch alloy wheels, auto-leveling headlights, leather, 10-way driver's and 8-way front-passenger's power seats, heated front seats, dual-zone automatic climate control, navigation with 8-inch touch screen, AM/FM/CD/MP3/SiriusXM with 8-speaker 550-watt Infinity audio, UVO eServices infotainment with voice command, Bluetooth, Smart Key with push-button start, steering-wheel-mounted audio/Bluetooth/cruise-control functions, stability control, Hill-start Assist and a full complement of all the usual and government-mandated safety features. To the base model the Premium version adds paddle shifters, power-folding mirrors, Panoramic sunroof, rain-sensing wipers, 12-speaker Infinity audio with Surround Sound and subwoofer and the availability of many features standard on the Limited. The Limited adds chrome 19-inch alloy wheels, HID headlights, heated steering wheel, power rear sunshade, power tilt-and-telescoping steering column, Nappa leather, memory, ventilated front seats, heated outboard rear seats, electric parking brake, Advanced Smart Cruise Control, Blind Spot Detection, Rear Cross Traffic Alert, Lane Departure Warning, Surround View Monitor, 7-inch LCD meter cluster, many trim items and the availability of Premium Nappa leather. Cruise-control systems that monitor traffic are quickly becoming one of our favorite modern features. The 2016 Cadenza offers one of the better systems, able to bring the vehicle to a full stop in sync with the car ahead, and automatically resume if the stop is two seconds or less. Leather trim can feel like rubber, but the Nappa leather available in the Cadenza is the soft-supple surface you expect. It's standard on the Limited and optional on the Premium, with even nicer Premium Nappa optional on the Limited. The only powertrain for the 2016 Cadenza is a 3.3-liter V6 of 293 horsepower and 255 lb-ft of torque with a 6-speed automatic. As is expected of the class and demanded by the buyers, the Cadenza engine and transmission combination is smooth, quiet, refined and thoroughly, unobtrusively capable, absolutely up to the competition's standards set by Toyota, Honda, Chevrolet, Hyundai and many others. It delivers fuel economy that can be considered average for the category. The 2016 Kia Cadenza is more sedan than you'd expect at less than you'd expect to pay. Roomy, comfortable, attractive, with a competent and smooth powertrain, luxurious interior and impressively lengthy complement of features, the Cadenza defines the notion of a lot of automotive bang for your hard-earned bucks. 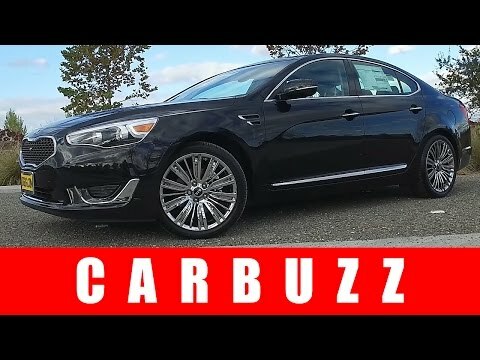 With three trim levels (the base is new this year) and a strong 293-horsepower 3.3-liter V6 engine, the very well-equipped Cadenza starts around $35K and can go up from there. That puts it near Toyota Avalon territory, price-wise, but the Cadenza is more engaging to drive, lacks nothing in feature content and should be seriously considered by anyone shopping for a luxurious, comfortable and very well-equipped sedan at an attractive price. My Kia is very physically comfortable for someone like me who has back issues. My Kia is great outside of minor issues such as car door problems. The seats are very comfortable and adjustable which is great for someone like me who does not like to be too close to the steering wheel, so the easily adjustable seats are a bonus. It also notifies when the driver does not have on a seat beat with a loud ringing which is annoying but helpful for someone like me who often forgets. I have not had many issues with the car outside of the ones that I have created due to my own clumsiness. The best Kia has to offer. This vehicle is the Kias version of a all luxury vehicle from the heated steering wheel to the all around heated seats. Full navigational controls, fully compatible with my phone so I never have to take my hands off the steering wheel or my eyes off the road. It rides like any other high end luxury vehicle it is everything you could possibly need in a vehicle. Car is well built and and seems to be a lot better car for money than comparable American made cars! Car rides very nice! Like the air conditioned seats. Car has been trouble free since purchasing! Trunk is hard to put bigger items in and when wet raising trunk water drips into trunk area and on you!